Improving the product safety is a top priority for participants in the global cosmetics industry. To ensure that their products are safe for human use, manufacturers of cosmetic products are using antimicrobial ingredients as additives in production techniques. Alcohols and other types of antimicrobial ingredients are being used in production of cosmetics, allowing the user to apply these products without being concerned about grave side-effects. Moreover, the role of antimicrobial ingredients in extending the product life is also supporting the robust end-use in the cosmetics landscape. Companies namely, Ashland Global Holdings Inc., BASF SE, Croda International Plc., Lonza Group Ltd., Clariant AG, The Dow Chemical Company, Solvay SA, Akzo Nobel N.V., Wacker Chemie AG, and Evonik Industries AG are expected to spearhead the global production of antimicrobial ingredients in the near future. According to Transparency Market Research’s latest report, the global antimicrobial ingredients market is poised to register global sales of nearly 118,000 tons of antimicrobial ingredients by the end of forecast period, 2017-2026. During this period, the global market for antimicrobial ingredients is assessed to expand at a CAGR of 4.1% in terms of volume. The report has observed these companies as the key stakeholders in the global antimicrobial ingredients landscape. Mexico and Brazil are among the leading producers of ingredients with antimicrobial properties. Relatively easy procurement of raw materials required to produce antimicrobial ingredients at a commercial scale continues to bolster Latin America’s antimicrobial ingredients market. In addition, low-wage skilled labor further aids the manufacturers, and increases the profit margins for players in the Latin American antimicrobial ingredients market. The report estimates that by the end of 2026, around 30% of antimicrobial ingredients produced in the world will translate into heavy revenues procured from Latin America. However, the report also projects that Europe and Asia-Pacific excluding Japan (APEJ) will represent fastest expansion by reflecting volume CAGRs above 5.5% during the forecast period. 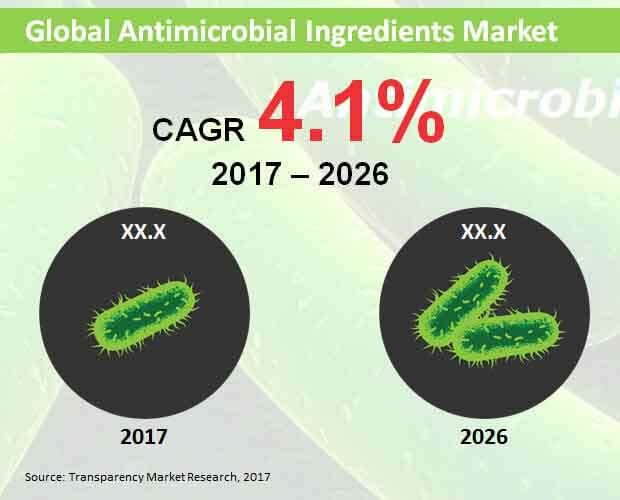 The report has forecasted that by the end of 2026, antibacterial agents will emerge as the top-selling products in the global antimicrobial ingredients market. Increasing importance of protecting cosmetic products from common bacterial outgrowth will continue to fuel the demand for antibacterial agents in the global antimicrobial ingredients market. By the end of 2026, more than 32,000 tons of antibacterial agents are pegged to be sold globally. The report has also assessed a lucrative growth in demand for antifungal and anti-parasitic agents throughout the forecast period. Majority of antimicrobial ingredients produced in the future will be used in manufacturing skin care products. By 2026-end, more than one-fourth of antimicrobial ingredients produced in the global market will be used in the production of skin care products. Hair care products is also expected to emerge as a key end-use of antimicrobial ingredients, and will register a volume CAGR of 4.2% over the forecast period. The report further estimates that antimicrobial ingredients will be predominantly manufactured in dry form over the foreseeable future. Limitations of liquid ingredients in terms of applications will continue to drive the scope for dry antimicrobial ingredients through 2026.